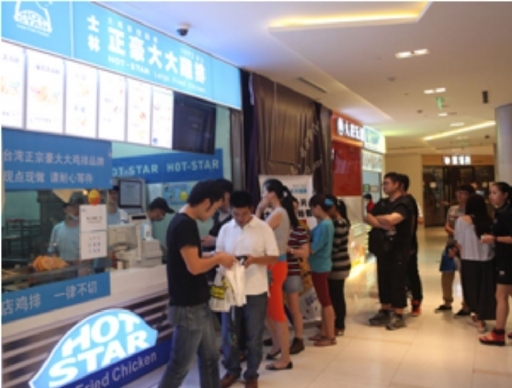 The opening of HOT-STAR Large Fried Chicken at Shanghai Yifeng Plaza has caused a craze of purchasing in Shanghai, which attracted attentions of nationwide unworthy business runners. These counterfeiters have used the HOT-STAR trade mark, changed the “Story of establishing Taiwan Shihlin HOT-STAR Large Fried Chicken”, or emphasized on their acquisition of the brand authorization of “Taiwan Shihlin HOT-STAR Large Fried Chicken” to mislead citizens of the public. Besides, they also recruit franchisees and regional dealers on the purpose of obtaining franchise fees or attracting consumers to purchase their products. However, the real creator of the HOT-STAR Large Fried Chicken is Mr. Qing-Long Wong. Please cautiously identify the real trade mark to make sure not being cheated. HOT-STAR Large Fried Chicken has now opened franchising in Shanghai, Nanjin and Hong Kong. For those who wish to become our franchisee, you are welcome to contact us by the telephone or visit us at the company store. HOT-STAR Large Fried Chicken has already registered the trade mark. For those who intend to counterfeit the trade market or use the reputation of this brand to conduct sales activities without an authorization, HOT-STAR Large Fried Chicken reserves the right to pursue legal actions against such person(s) to the full extent allowed by the law.